Photos on the constituent lines of the former LNER, excluding the East Coast Main Line, Scotland and parts of the Chiltern lines which have their own dedicated collections. As usual, a few shots to start with, many more to add! Whitby Town station still has its BR North Eastern Region tangerine signs in August 1968. This is the view looking south towards Grosmont, where the signalbox from Whitby was used to build the present signalbox after it was removed from here. Also gone are the goods shed and the bay platforms on the left, the only platform still in use being the one on the far right in the shade. Platform 2 still remains but is much shorter and has no track. The engine shed (out of sight to the right in this picture) still stands and there are still run round loops beyond where the signalbox stands. Much of the rest of the station and goods yard is now occupied by a supermarket, car parking and an extended marina. The station building itself, behind the camera position, also survives. 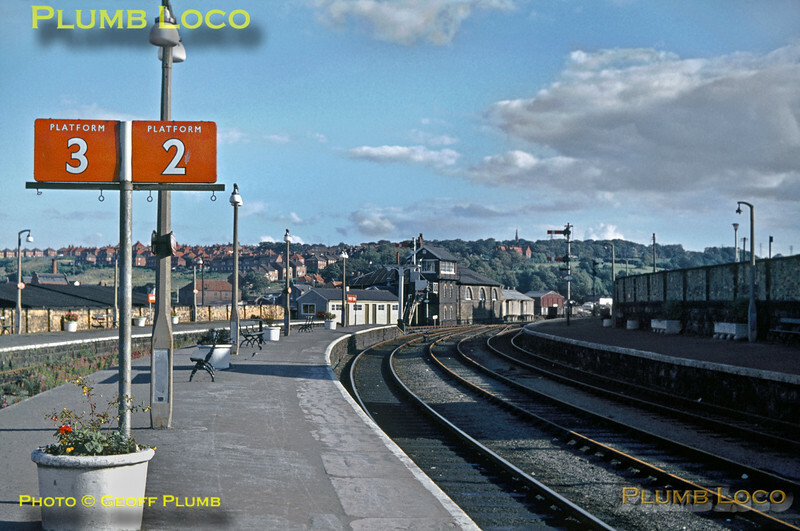 Now, Platform 2 has been lengthened again and reopened; NYMR locos can run round their train in the station once again. Slide No. 3367.